In yet another show of new technology and commitment to the latest and best treatment, doctors at Aster CMI hospital successfully treated two patients suffering from severe liver disease by using unique methods of treatment. The Integrated Liver Care (ILC) team at Aster CMI Hospital has had two cases in the recent past which were referred for a Liver transplant but the doctors did their own assessment and diagnosis which required not a transplant but another way of treatment. The team at the hospital proved that treatment of liver crisis need not always require liver transplant.Eight-year-old Sudha (name changed) was referred to Aster CMI doctors for a liver transplant as she showed classic signs of acute liver failure – abdominal swelling due to fluid accumulation, jaundice and coagulopathy (increased risk of bleeding due to thinning of the blood). The doctors, who made an assessment realised that the liver failure was due to Wilson’s disease (a condition where copper starts to accumulate in the liver), which could be treated with medicines rather than liver transplant. Immediately, Sudha was made to undergo a trans-jugular liver biopsy, which is a special technique to obtain a biopsy from the liver without the risk of bleeding.Doctors had evaluated Sudha’s mother as a potential living liver donor and the necessary legal paperwork and clinical tests had been completed. Dr Naveen Ganjoo, Consultant- Hepatology and Liver Transplantation, Aster CMI Hospital said: “This was done in anticipation of worsening of Sudha’s liver disease, which could necessitate urgent liver transplant. Sudha was immediately commenced on treatment for Wilson’s disease. A special test was conducted to ascertain copper level in the tissues and pathological examination of the liver tissue was done too. This confirmed our suspicion of Wilson’s disease and we continued with the medical treatment. She now has normal liver functions, is attending school and is a playful child as any other of her age group. The significant importance of the genetic test played the major role in this case.”Sudha is the eldest of three siblings of a consanguineous marriage – a marriage between close relatives. Wilson’s disease, in which copper accumulates in body tissues, mainly brain and liver, is a genetic disease. Each gene in the body has two parts and everybody inherits one part each from parents. When both parts are abnormal, the individual develops Wilson’s disease.Another patient,13-year-old Chetana (name changed), too was referred for a liver transplant. She had developed recurrent jaundice for the first time two years ago and for the second time, 11 months ago. Initially, her jaundice had settled with some treatment at a hospital elsewhere. However, the second episode of jaundice was severe and resulted in swelling of feet and abdominal fluid accumulation, so she was referred for transplant. She had developed acute chronic liver failure. Investigations including a liver biopsy revealed she was suffering from Auto Immune disease, which had severely damaged her liver.Dr. Kaiser Raja, Sr. 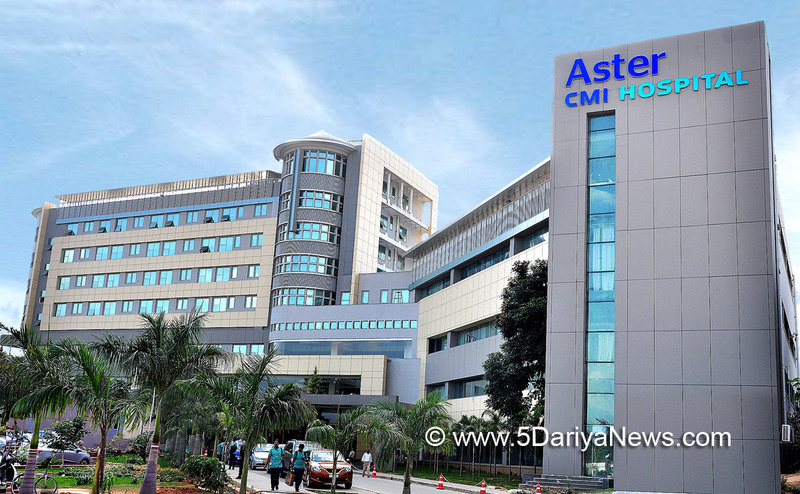 Consultant – Hepatology & Liver Transplantation, Aster CMI Hospital said: “She met criteria to undergo a liver transplant. However, given her pubertal age and her diagnosis of an underlying autoimmune disease (a condition where the body’s immune system itself begins to damage certain organs), we commenced her on medical therapy. Chetana recovered very positively from acute liver failure. Her jaundice came down significantly and excess body fluid disappeared. Post-treatment, she has been attending school. We are keeping liver transplant as a backup option but are highly optimistic that she can do without it for now. She still has a chronically damaged liver which will need a transplant but this can be put off for at least in the near future. The advantage of postponing this big operation is that she would have completed her pubertal growth and will be in a much better nutritional shape for her surgery when she needs it.Commenting on the treatment of the two patients, Dr. Rajiv Lochan, Senior Consultant - HPB and Liver Transplant, Aster CMI Hospital said: “These patients exemplify two points. Firstly, all patients with liver failure do not need a liver transplant straightaway. Some reversible causes of this condition do occur and they should be looked at. However, this should be done in the setting of a Liver Unit, where an urgent transplant could be carried out if things change in a short period of time. In Sudha’s case, a combination of traditional clinical assessment methods and modern cutting edge technology helped to identify the disease in her.”The doctors involved in the team included transplant surgeons Dr. Rajiv Lochan, Rehan Saif, Dr.Jayanth Reddy, Dr.Sonal Asthana and transplant hepatologists Dr.Mallikarjun Sakpal, Dr. Naveen Ganjoo and Dr. Kaiser Raja.